The new generation of Gorenje's XtremePower induction hobs offers incredible cooking power! PowerBoost function is activate, high-performance induction coils made of state-of-the-art materials, and two cooling fans with double operating power will kick in to supply extra power to the hob. Smart switching between cooking zones distributes the power between the integrated inductors to allow cooking at maximum power on all cooking zones simultaneously. Rapid heating function that delivers extra performance of the induction hob. 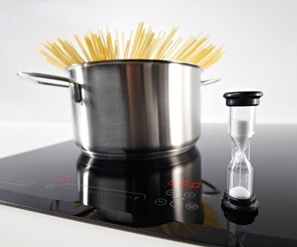 Induction technology heats the bottom of the pot or pan; therefore, the entire surface of the hob which is not in direct contact with the cookware will remain cool and safe to touch. Setting the power of a cooking zone on the multi-level scale is incredibly simple: just gently slide your finger across the control surface In addition to sensibility and responsiveness of the hob, the ergonomic placement of controls allows perfect control. Needless to say, the hob offers a child lock function to prevent children from using the hob without your supervision. Each cooking zone features its own module and a touch control timer. Hence, cooking time can be set for each cooking zone. After the expiry of the set time, the cooking zone will switch off automatically and sound an acoustic signal. Nine-level heating power scale allows accurate settings of cooking parameters. Excellent overview is further enhanced by the modern and intelligible graphical symbols. BoilControl system will automatically increase heating power when the highest level is set in order to heat up the food as soon as possible. After initial operation at maximum power, the hob will automatically reduce the power to the previously selected setting, keeping the cooking zone at desired temperature and preventing the food from boiling for too long, or even boiling over. This convenient function can be activated or deactivated at any time. 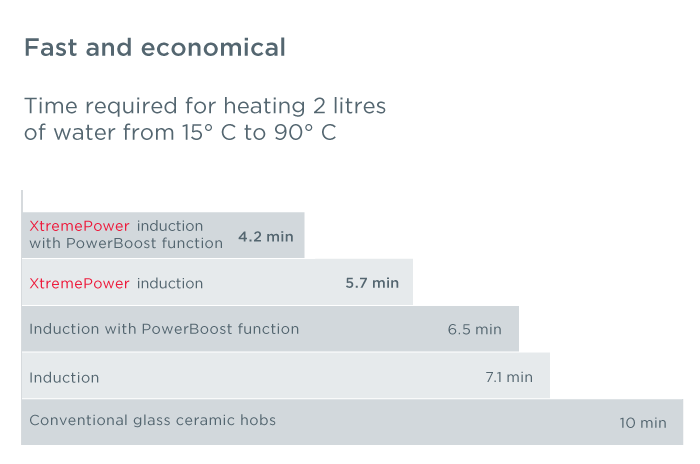 The StayWarm function will allow you to keep the food that you have cooked at an optimum temperature of 70°C. Thus, your dishes will maintain the flavour and stay warm to be served later on. These two innovative functions will simplify the cooking process, prevent overheating, and save energy. An excellent addition to your cooking! The SoftMelt function operates at a constant temperature of 42°C. Delivering an even heat, it is appropriate for melting honey, butter, and chocolate without any additional procedures. This type of setting is also appropriate for defrosting pre-cooked food and smaller amounts of frozen vegetables. 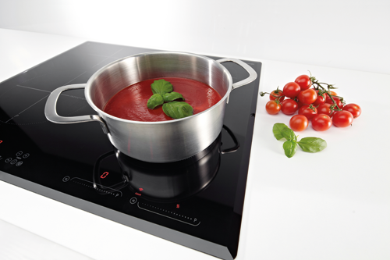 Gorenje XtremePower induction hobs offer more space, easier handling of cookware, and improved control during the cooking process. When cooking on all zones simultaneously, your pots and pans will not be crammed on the cooktop owing to carefully planned layout of the cooking zone and larger hob surface. Because the hob will only heat up directly underneath the cookware, the food will never burn or stick to the cooker surface. If anything is spilt on the hob, just wipe off. All you need to clean is tap water. 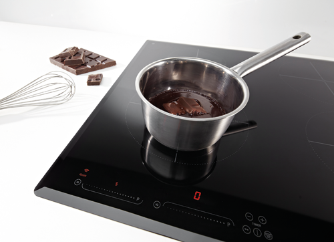 Intelligent switching between inductors, and the highest quality of integrated components reduce the clicking and popping noise characteristic of induction hobs. The StopGo function instantaneously turns off all cooking zones while saving all current settings; a simple touch will restore the cooking process. Hence, if the food boils over, the StopGo function can be used to let you clean up and simply continue as soon as you are done. The StopGo function will keep your cooking under control, even when, for any reason, it is interrupted.